This book gave a different perspective on Amish life than what I've usually seen. The families in this book are New Order Amish. Amanda wears a peach colored dress; her daughter wears pink and they have a phone in the house. I don't know what other differences exist between these New Order Amish and the Old Order Amish about whom many books are written. Also, instead of a farm in Ohio or Pennsylvania, much of this story is set in Florida. I enjoyed watching these two young (though not so young) people learn to love again. 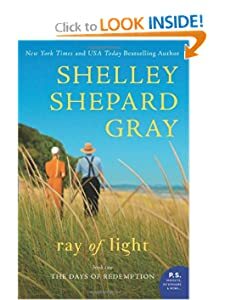 Shelley Shepard Gray brought forth how hard it must be to lose an only child in a culture that is very family-oriented (not that losing a child is ever easy). Her in-laws are supportive of her--except when she starts to want to move on with her life. The book is the second in a series and I have not read the first. The main couple makes a cameo appearance--he is a missionary to Belize and while they are engaged, she goes to visit him. I never knew that the Amish had missionaries. There are references to some backstory that those of us who have not read the first book wonder why are included as they add nothing to this story. In short, this was a relatively short interesting read about two charming people from a slightly different Amish community. Thanks to the folks at Litfuse for providing a complimentary review copy. Grade: B.